Trucks and their trailers keep Australia moving and there are thousands of trailers being towed by trucks on our roads every day. It’s an essential part of our economy and really drives the livelihood of every Australian. However, there may come a time when you have a trailer but no truck available to tow or float the trailer and in these instances you’ll need to enlist the services of a professional heavy hauler to shift the trailer for you. Whether it’s a semi-trailer, curtainsider trailer or a B-double trailer, you’ll need to find a reliable and experienced transporter and driver to carry the load for you. Get quotes for moving truck trailers today! Semi-Trailer: If you require a freight quote for heavy haulage services such as relocating by floating a flat deck semi-trailer, then you’re going to want to find a transport company who is highly experienced in carry this type of oversized freight. To float a semi-trailer requires a flat top or drop deck trailer to transfer it from the pickup and delivery locations both intrastate and interstate. Alternatively, you’ll need to find a truckie with the correct vehicle to tow the semi for you. Flat Deck Trailer: Flat deck trailers are some of the most common trailers to be floated and are regularly carried in loads of multiple flat deck trailers stacked on the back of a flat deck or drop deck trailer. These are floated within regional and metropolitan areas as well as interstate and through to capital cities such as Sydney, Melbourne and Perth. Curtainsider Trailer: Curtainsider trucks and trailers are some of the more common heavy vehicles and trailers that we see on suburban Australian roads. Curtainsider trailers are also utilised to carry freight interstate and throughout every state across Australia. To relocate a curtainsider, you’ll need to find a heavy haulage transporter able to carry either a semi, B-double or smaller pallet curtainsider trailer. Drop Deck Trailer: The drop deck trailer is a great option when the height of the freight you need shifted is bordering on Australian height restrictions. Sometimes these handy and versatile trailers require transportation too and, in this instance, you’ll need to find a reliable transport company that is able to take on your drop deck trailer freight to provide you with a quote. B-Double Trailer: A B-double trailer should only be towed, not floated, for transportation so you would be looking to find a truckie with a prime mover to provide a freight quote for moving a B-double trailer. B-doubles are towed interstate, regionally and through metropolitan areas across and throughout Australia. Float Trailer: A float trailer is a sturdy and heavy duty trailer that is used to carry equipment through rough terrain. They can be floated on the back of a flat deck or another float trailer and can be secured for transport using the fold-down legs. Batching Plant Trailer: Mobile concrete batching plant trailers are used across many industries and sometimes they need to be transported for various reasons. If you need to move a batching plant trailer then you’ll need to find a reliable transporter to perform the job for you. Float Trailer & Dolly: A float trailer and dolly is generally used to float large and heavy machinery. In most instances, you’d be looking to find a transport company with a prime mover or rigid truck who can tow the float trailer and dolly for you on the back of the truck. Skel Trailer: Skel trailers can be stacked on top of each other to carry multiple skel trailers in one load. 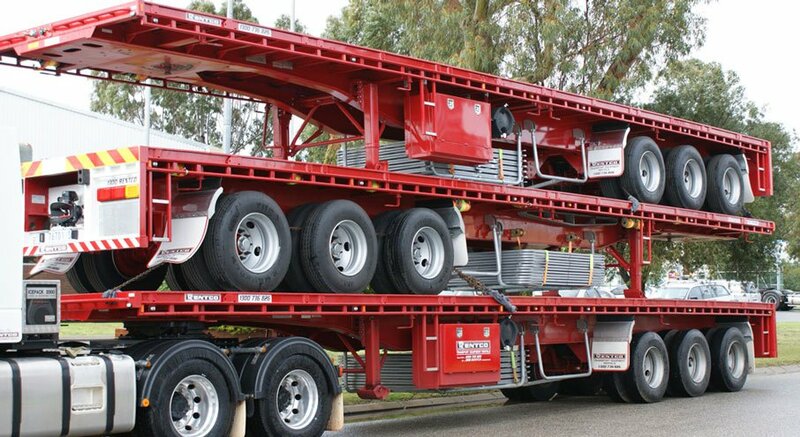 Whether you need them transferred interstate, such as from NSW to Victoria or the North Territory to SA, you can find a reliable transport company to float your skel trailer. Plant Trailer: The type of truck or trailer able to float a plant trailer will be determined by the length and width of the truckie’s truck or trailer. As a plant trailer is obviously not driveable, they need to be winched onto the back of a truck’s trailer and the loading ramps collapsed for transit. Logging Trailer: If you need a logging semi-trailer relocated to another state, be that Victoria, NSW or even WA, you can find a dependable, experienced transport company and driver who can make the trip for you and get the logging trailer to its destination. Low Loader Trailer: With the loading ramps folded up, a low loader trailer or low loader semi-trailer can be floated and stacked for transport. You can get quotes and costs for relocating this type of trailer. Belly Dumper Trailer: A belly dumper trailer dumps the bulk tipper products from the ‘belly’ or the base of the truck’s trailer. This makes it convenient in tighter spaces or other circumstances when a side or rear tipper trailer can’t be used to unload and deliver bulk tipper products. Tipper Trailer: As tipper trailers are some of the tallest trailers on the road, they do need to be towed rather than floated. You can find an ABN registered transport company to provide you with a quote on costs to relocate your tipper trailer. Side Tipper Trailer: Utilised across industries such as mining, earthmoving and even farming, the side tipper trailer conveniently dumps the bulk tipper products from the side. They can be towed by a skilled and experience driver. Pig Trailer: A pig trailer is most commonly towed behind a flat deck trailer for transport, however, it can also be floated. If you’ve made a new purchase and need to get it moved interstate, you can find a carrier with the correct trailer to tow or float a pig trailer. Side Loader Trailer: Primarily a side loader trailer is utilised to load, unload and relocate shipping containers. You can find reliable and professional heavy haulage companies to tow a side loader. Refrigerated Trailer: Due to the height of a refrigerated semi-trailer, it will need to be towed rather than floated. If you need a refrigerated trailer relocated then you’ll need to find a dependable and experienced driver and carrier to move that for you. Dog Trailer: Whether you require a five or a six axle dog trailer relocated anywhere across the country, then you can find a transport company with the right vehicle to tow your trailer freight. Tag Trailer: If you’ve made a recent purchase of a tag trailer and you need it moved anywhere across Australia, both locally and interstate, then you’ll need to find a reliable and experienced transporter to carry the tag trailer for you. Pole Trailer: A pole trailer can be loaded on the back of the truck and towed to the pickup and delivery locations. This could be from capital cities, such as Sydney, Brisbane or Melbourne, or other interstate trips between regional and rural areas. Livestock Trailer: Livestock is moved across Australia from interstate farms or even intrastate through regional and rural areas and then through metropolitan areas in capital cities such as Adelaide, Canberra and Darwin. Whether it’s a semi, B-double, a B-triple or a road train, you’ll need to find a reliable heavy haulage expert with the right truck to pull your load. Tanker Trailer: Due to the sheer dimensions of a tanker trailer, they will always need to be towed and if you need a tanker trailer relocated, then you’ll need to connect with a carrier who is experienced with towing a tanker trailer. Road Train Dolly: You can get a freight quote from a professional truckie in order to tow a road train dolly behind a truck. In some circumstances they may need to be floated so you’ll need a driver who has the right vehicle and equipment to perform that for you. Quad Axle Float & Dolly: If you need to have a quad axle float and dolly transferred interstate, regionally or through metropolitan areas then you’ll need to find a transporter with the right vehicle to relocate that for you. Low Loader Dolly: A low loader dolly can be floated or it can be towed if it is in the required condition to do so. You can get a freight quote to tow or float a low loader dolly by professional and ABN verified transport companies located across Australia. Finding a heavy haulage transporter to float a flat deck or float trailer means you’ll have to find a truckie who is highly experienced in shifting heavy loads. If you need to have the truck trailer towed, then you’ll have to find a driver with the right truck to tow the trailer, be that for a B-double trailer or even a curtainsider. FreightQuotes can connect you with transport companies and truckies able to haul and tow trailers for trucks. Simply submit your free freight quote request and you’ll receive three quotes from three different truckies who have the right vehicle and are operating within the areas you need the trailer moved. Simple, easy and convenient. Truck trailer transport is available Australia wide. This includes interstate, regional and metropolitan freight covering all states and capital cities including Adelaide, Brisbane, Perth, Darwin, Melbourne, Canberra, Hobart and Sydney. You can find truck transport quotes with FreightQuotes too. Get 3 Quotes for transporting trailers for trucks. It’s free to request quotes.